Downers Grove is a village in DuPage County, Illinois, United States. It was founded in 1832 by Pierce Downer, whose surname serves as the eponym for the village. 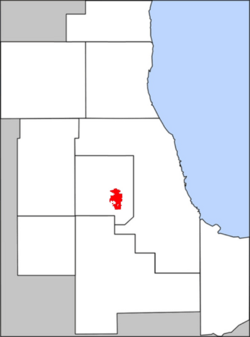 Approximately 20 miles from the Loop, Downers Grove is a far south-western suburb of Chicago. The most recent census estimate tallied 49,715 residents in 2014. Downers Grove was founded in 1832 by Pierce Downer, a religious evangelist from Wampsville, New York. Its other early settlers included the Blodgett, Curtiss, and Carpenter families. The original settlers were mostly migrants from the Northeastern United States and Northern Europe. The first schoolhouse was built in 1844. The Chicago, Burlington and Quincy Railroad was extended from Aurora to Chicago through Downers Grove in 1862, boosting its population. The town was incorporated in March 1873. Its somewhat unusual spelling ("Apostrophe-free since 1873") remains a minor historical mystery. The construction of two major toll roads along the village's northern and western boundaries, I-355 in 1989 and what is now referred to as I-88 in 1958, facilitated its access to the rest of Chicago metropolitan area. Downers Grove has developed into a bustling Chicago suburb with many diverse businesses, including the headquarters for Devry University, FTD, Ambitech Engineering Corp, Dover, Heartland Food Corporation, and HAVI Global Solutions. Downers Grove is located at . According to the 2010 census, Downers Grove has a total area of 14.457 square miles (37.44 km2), of which 14.31 square miles (37.06 km2) (or 98.98%) is land and 0.147 square miles (0.38 km2) (or 1.02%) is water. Only the DuPage County communities of Bartlett, Aurora, Naperville and Bolingbrook have larger land areas. Within the town are two forest preserves: Lyman Woods and Maple Grove Forest Preserve. A small creek runs through Maple Grove forest preserve. Downers Grove has been designated a Tree City USA 28 times by the National Arbor Day Foundation. Downers Grove borders the communities of Oak Brook, Westmont, Darien, Lombard, Woodridge and Lisle. Downers Grove is in a humid continental climate zone. On average, January is the coldest month, and July is the warmest month. August typically has the most precipitation, and February the least. The record high for Downers Grove was 105 °F (41 °C) in July 2005, and the record low of −26 °F (−32 °C) was set in January 1985. The main line of the BNSF Railway Line, the line is also used by Metra commuter rail. Metra's BNSF Railway Line has three stops in Downers Grove at Belmont Road, Main Street, and Fairview Avenue. Interstate Highways 355 and 88 all pass through the community as well as the major surface street US 34-Ogden Avenue. Downers Grove is served by the Pace Bus Service, a system of suburban public transportation. The Grove Commuter Shuttle runs four routes throughout the community to two of the three train station that are in the village. The shuttle also operates for the RotaryGrove Fest from remote parking lots on the north and south sides of the village located at the respective north and south high schools. Downers Grove is home to many unique boutique shops, dining establishments, and community events. Downtown Downers Grove has quickly become a shopping and dining destination due to its location and variety. The Tivoli Theatre and over 140 community events and festivals, which attract thousands of visitors each year, has helped to earn Downtown Downers Grove a spot on Chicago Tribune’s “Top 10 List of Downtowns.” of parks for recreational use are available with 450 recreational activities are available throughout the year. On Friday nights throughout the summer, antique and specialty cars park downtown in an informal car show. The Indian Boundary YMCA sponsors a Saturday morning farmer's market from June to October, and an ice sculpture festival is held in January. Downers Grove drinking water comes from Lake Michigan, via the DuPage Water Commission pipeline, which purchases the water from the City of Chicago Department of Water Management. Its electricity infrastructure is largely maintained by Commonwealth Edison Company (ComEd); its natural gas infrastructure was built by Northern Illinois Gas. Household waste pickup is contracted out by the village to Republic Services, as is yard waste pickup; these are paid for by either household-purchased stickers or rented carts. Curbside recycling is free. Waste water is treated by the Downers Grove Sanitary District. As of the 2010 census, there were 47,833 people residing in the village. The population density was 3,420.2 people per square mile (1,320.2/km²). There were 20,478 housing units at an average density of 1,367.2 per square mile (527.7/km²). The racial makeup of the village was 88.5% White, 3.0% Black or African American, 0.2% American Indian and Alaska Native, 5.5% Asian, 0.6% Native Hawaiian and Other Pacific Islander, 1.2% from other races, and 1.6% from two or more races. Hispanic or Latino of any race were 5.2% of the population. There were 1,979 households out of which 32.2% had children under the age of 18 living with them, 59.1% were married couples living together, and 7.2% had a female householder with no husband present. 27.4% of all households were made up of individuals and 12.0% had someone living alone who was 65 years of age or older. The average household size was 2.56 and the average family size was 3.13. In the village, the population was spread out with 22.8% under the age of 18, 6.6% from 18 to 24, 29.3% from 25 to 44, 25.0% from 45 to 64 and 14.3% who were 65 years of age or older. The median age was 39 years. For every 100 females there were 92.4 males. For every 100 females age 18 and over, there were 87.7 males. According to the 2010 American Community Survey, the median income for a household in the village was $84,269, and the median income for a family was $98,623. The mean income for a family was $108,798. Males had a median income of $63,553 versus $40,353 for females. The per capita income for the village was $43,579. About 1.7% of families and 4.6% of the population were below the poverty line, including 8.2% of those under age 18 and 18.2% of those age 65 or over. Downers Grove, Illinois Facts for Kids. Kiddle Encyclopedia.